The new department was led by John Beechey, who went on to serve as president of the ICC International Court of Arbitration from 2009 to 2015. Over 15 years, the group became a major international arbitration brand – strong in London, New York and Paris. It also became something of a training ground for lawyers seeking to get a start in the field. But a tough financial crisis and the departure of Beechey and another key partner, Jason Fry, for the ICC left the group looking a little lean. The reinvigorated group is now co-led by Audley Sheppard (who became a QC in 2015 and chair of the LCIA Board in 2017) and Fry, who rejoined the Paris office in 2012 after five years with the ICC. Fry’s deputy at the ICC, Simon Greenberg, also joined in Paris and was rapidly promoted to partner. Other names to know in London are Rob Lambert, Alex Panayides, Marie Berard, Janet Whittaker and Jessica Gladstone (who joined from Debevoise & Plimpton in 2015 and brings public international law experience). Ignacio Suárez Anzorena in Washington, DC, and Romesh Weeramantry in Hong Kong specialise in investment treaty arbitration. Ben Luscombe and Sam Luttrell in Perth are also active in this area. The group’s areas of expertise include the Energy Charter Treaty and its relationship with EU law. It was one of the first firms to fight cases on this. 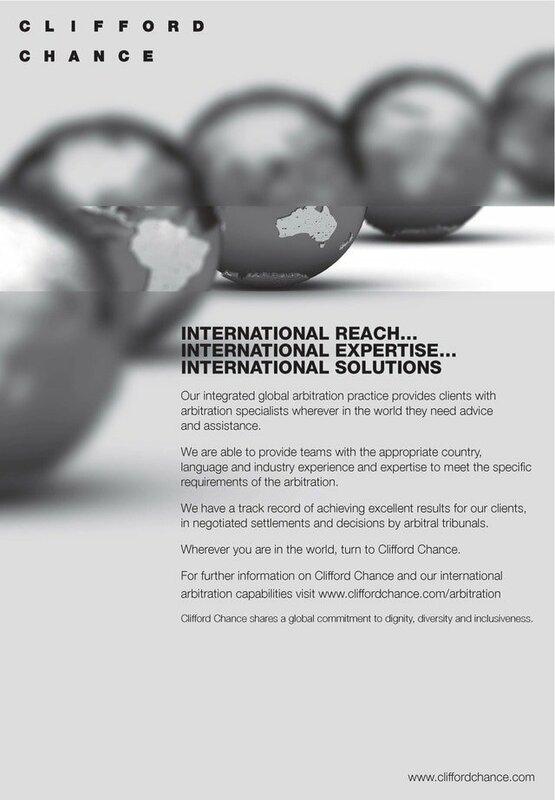 Clifford Chance operates from 26 countries. For international arbitration, the most important offices are London, Paris, Hong Kong and Singapore. Other practitioners are stationed in Amsterdam, Düsseldorf, Frankfurt, Munich, Madrid, Milan, Rome, Warsaw, Moscow, Dubai, Hong Kong, Tokyo, Perth and Sydney. In Singapore, the firm formed an alliance with local boutique Cavanagh Law in 2012 and was one of the first international law firms to obtain approval to open an office in Seoul. The wider firm has a great name in banking and finance, leading to some exciting banking-related arbitrations involving institutions such as Crédit Agricole, Standard Chartered Bank and Standard Bank of South Africa. Otherwise, it’s a pretty mixed bag. Energy clients include Abengoa, BG Group, E.ON, GE, Iberdrola, Shell, Sinopec and Statoil. It’s advised Hyundai Heavy Industries, US defence contractor Raytheon Systems, and the French Football Federation. Former French football star Michel Platini has used the firm. In the Middle East, it has represented Abu Dhabi sovereign wealth fund IPIC (now Mubadala). Clients in investment treaty work have included EDF, Italian power company Enel, and mining companies Churchill, Kingsgate Consolidated and Cortec. Some rare examples of state clients are: France in a €300 million dispute over a rail link; and São Tomé and Príncipe in a law-of-the-sea arbitration filed by Malta over the detention of an oil tanker. In 2013, the team won a US$1.4 billion partial award for Shell and its consortium partners in an Abuja-seated arbitration against the Nigerian National Petroleum Corporation. A Nigerian court later enjoined the arbitration from continuing. A US court petition to enforce the award has been stayed pending a challenge to the Nigerian injunction. In the same year, the firm secured an award of over US$100 million for French bank BNP Paribas in a long-running dispute with Basic Element Group, owned by Russian oligarch Oleg Deripaska. For Raytheon, it won a £224 million LCIA award against the UK government in 2014 in a dispute over a failed plan to implement an electronic border control system. The award was later overturned in the English courts but the UK settled the dispute with a payout of £150 million in the following year. On the investment treaty side, it won US$45 million for Abengoa in an ICSID claim against Mexico and settled Enel Green Power’s dispute with El Salvador, securing a US$280 million payout for the claimant. The German disputes team managed to set aside a €220 million award from the German Arbitration Institute (DIS) – one of the few times that a DIS award of that magnitude has been overturned. Another settlement was for Bawabet Al Kuwait – part of the business empire of Kuwait’s wealthy Al-Kharafi family – in a US$400 million ICSID claim against Egypt. The case concerned gas pricing and tax measures affecting a petrochemicals investment. In early 2019, the firm’s Perth and Hong Kong offices helped Australian mining company Kingsgate settle a lawsuit against its political risk insurers concerning the expropriation of a gold mine in Thailand. The US$58 million settlement will allow Kingsgate to finance an UNCITRAL arbitration against Thailand relating to the mine, in which Clifford Chance is also acting. After obtaining a US$95 million LCIA award in favour of Russian client Vladimir Chernukhin against Oleg Deripaska in 2017, the firm defeated a challenge to the award in the English courts. The judge found Deripaska had given “dishonest evidence”. There have been some noteworthy recent settlements. Lawyers in the Singapore office helped a group of private equity investors including SBI Macquarie, Standard Chartered and JM Financial-Old Lane settle a US$1.3 billion dispiute with Indian airport infrastructure group GMR in 2018. The Paris, Amsterdam and London offices helped Swiss billionaire Margarita Louis-Dreyfus settle an ICC dispute by completing a US$900 million buyout of other family members’ minority interests in agricultural commodities trader Louis Dreyfus. The London office also helped Abu Dhabi’s IPIC settle a US$6.5 billion LCIA claim against Malaysian sovereign wealth fund 1MDB in 2017. However, in the wake of a scandal over missing funds at 1MDB, a new government in Malaysia has applied to the English courts to set aside the settlement. There were some disappointments for mining clients in a couple of ICSID cases. The firm failed to revive a US$1.3 billion claim for Churchill Mining against Indonesia in early 2019, with an annulment committee upholding an award that found evidence that mining licences had been forged. Another claim by Canadian-owned client Cortec Mining against Kenya was dismissed on jurisdictional grounds in 2018 after a tribunal found a purported mining licence was issued in violation of local environmental laws. The firm continues to act for claimants in four other ICSID cases. Australian mining company Tantalum International is using it in a dispute with Egypt over a tin and tantalum mine. The firm acts for German solar power investor STEAG in one of the many Energy Charter Treaty cases against Spain relating to its renewable energy reforms. Canadian mining company Red Eagle is using it for an ICSID claim against Colombia after its mining operations were found to overlap with an environmental preservation zone. A hydroelectric subsidiary of Italy’s Enel has also recently instructed it for an ICSID claim against Panama over the state’s failure to compensate it for commercial damage caused by delays to the construction of a power line. Another ICSID claim the firm had been pursuing for Singapore’s OleoVest against Indonesia over a palm oil refinery was discontinued in 2018. New instructions have also come from wind power company Invenergy in a treaty claim against Poland; and from the Albanian government and a state-owned entity in a dispute with GBC Oil over the termination of oil extraction rights. In the commercial arbitration arena, it has won a US$100 million LCIA award for ICBC Standard Bank against two Mongolian companies that is the subject of a court challenge. France’s Bouygues Construction has also retained the Frankfurt office to defend it in a post-M&A purchase price dispute with Switzerland’s Alpiq, which is being heard at the Swiss Chambers. Recent additions to the team include Moritz Keller of Freshfields Bruckhaus Deringer in Vienna who joined the Frankfurt office, while the firm hired Peter Coney as Tokyo practice head from Japanese firm Nagashima Ohno & Tsunematsu. Paul Coates was made up to partner as he relocated to Dubai. Sam Luttrell was promoted to the partnership in Perth. The head of dispute resolution at a major international oil company that retained the firm for drilling-related disputes in Iraq says he sees it as an “extension” of his in-house team and praises the quality of its advice, which prioritises business sense and commercial objective over “esoteric legal argument”. He describes partner Alex Panayides as “on the ball” and adds, :”Whether he’s on a plane or in a meeting half way around the world – a response to your question is guaranteed.” The client also praises Paul Coates, whose “measured and calming approach” will make him “a worthy partner someday soon”. Wherever in the world, whatever the industry, our global arbitration practice has the expertise and experience to assist. We work with clients to help to resolve their complex disputes effectively and efficiently. Our approach is pragmatic and commercial. We draw upon a decades-long track record with international arbitration to provide a variety of options that address current and future commercial risks, in addition to solving legal issues. We aim to develop and maintain long term relationships with our clients. For global corporations, disputes can arise in many jurisdictions. We have built a global structure across 32 offices to match our clients' international scope. Our worldwide arbitration experts sit in offices across all of the major arbitration centres – including the UK, Europe, Asia-Pacific, the Middle East and the Americas and work together as one cross border team, drawing upon our varied experience and resources across our offices. Arbitrations are increasingly more customized to specific industry sectors. Clients come to our team for the additional knowledge provided by our sector-specific experts that specialise in construction, infrastructure, pharmaceutical, aerospace & defence, banking & finance, insurance & reinsurance, shipping & transport and telecommunications disputes. These experts bring a deep understanding of the industries in which our clients do business. We also act for governments and we appreciate the political dimension. Arbitrators and clients expect participants to be familiar with the applicable rules and procedures. We conduct arbitrations pursuant to the rules of all the leading arbitral institutions, and ad hoc arbitrations under UNCITRAL and other rules. Our lawyers have leadership positions in many arbitral organisations, and they regularly write and speak on arbitration issues. They also sit as arbitrators. We are there with local knowledge and industry experience, and arbitral expertise, wherever and whenever clients need us.